There’s no place like home, so says the oft uttered phrase, but for Red Bull Racing, they have to prove themselves at back-to-back home races. The European Grand Prix was a disappointment to say the least. Despite Daniel Ricciardo starting on the front row, a seventh place finish for his efforts was far from the result the team from Tilbrook wanted. 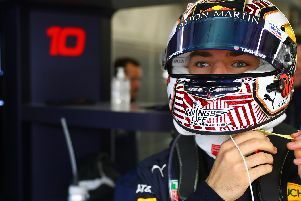 Max Verstappen’s troubles in qualifying meanwhile saw him climb from ninth to eighth - a far cry from his heroic fourth place finish in Canada in the previous race. This weekend, racing returns to the Red Bull Ring in Austria, a circuit owned by energy drinks magnate Dietrich Mateschitz - the first of two ‘home races’ for Red Bull Racing. A week later comes the British Grand Prix at Silverstone in a double-header. Historically, the team has struggled to impress in Austria. At the first race back at the newly refurbished circuit in 2014, Ricciardo was only able to salvage an eighth place finish, while world champion team mate Sebastian Vettel was eliminated after 34 laps with electrical problems. Fast forward 12 months and things were even worse for the team, with Ricciardo finishing 10th for a single point, while Daniil Kvyat finished outside the points in 12th, a lap down on winner Nico Rosberg. To rub salt in the wounds, Verstappen, then driving for Toro Rosso, finished high than both. The race this weekend looks to be a better prospect though. The race in Azerbaijan aside, Red Bull are beginning to find their feet again. While a long way off the outright pace of the dominant Mercedes cars, Red Bull are looking to bridge the gap to Ferrari - recognised as the second fastest team in F1. Their progress has seen them pick up a win this season - a step further than Ferrari have managed - though their lack of consistency has seen the Italian giants open a 37 point gap to Red Bull in third. “We haven’t had the results we would like in Austria in the past but I think we’re coming there with our best package yet so hopefully that can put us up into the top five,” said Ricciardo. “Spielberg always has a pretty awesome atmosphere, and the setting is pretty amazing – the Austrian backdrop and the countryside is quite beautiful. Verstappen added: “In Austria you don’t have so many corners but the elevation changes makes it pretty special, and now driving for Red Bull you feel that even more as it’s our home GP so you feel very welcome by the fans. I think this year there are a few Dutch fans who are coming so I’m looking forward to it.